Whatever you want to call it, it’s almost time to pack our bags and head to Atlanta for the 2017 EDGE Conference! There is still time to register and join us at Supply Chain’s Premier Event™ for educating and connecting the world’s supply chain professionals, CSCMP’s 2017 EDGE Conference. The Council of Supply Chain Management Professional’s (CSCMP) Annual Supply Chain Conference, EDGE, draws over 3,000 supply chain management professionals from around the world. EDGE is the only event in the industry that represents the entire end-to-end supply chain. Check Out This Year’s Session Line Up! EDGE educational sessions are presented by CSCMP members and represent the best practices, knowledge and training of CSCMP’s academic and supply chain practitioner members. CSCMP EDGE 2017 features over 100 sessions and nearly 300 expert speakers from all over the world. Our highly engaged speakers are ready to provide you with end-to-end supply chain best practices, practical research and innovative solutions that you can take back to your organization and apply right away. 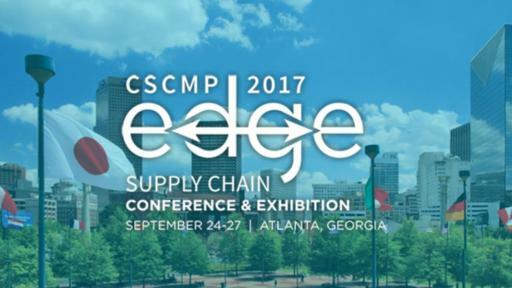 #CSCMPEDGE One-Day Tickets Available. Choose the Day That’s Right for You. The Special One-Day Rate of $995 Is Available with Code EDGE17-Metro1. Global leaders representing nearly all industry sectors, government, and academia will be attending this event presenting unlimited opportunities to learn from industry experts, hear dynamic speakers, and network with the most influential supply chain leaders in the world. Attendees will have opportunities to connect to the latest supply chain management knowledge, research, and industry developments. Join colleagues from around the world and make connections that will accelerate your success. Learn about the latest trends and technological advancements, from driverless cars to supply chain drones and last-mile delivery to blockchain 101. Attendees will have the opportunity to learn about unlocking growth in their organization’s supply chain and creating cost effective fulfillment networks. Learn how to harness big data to drive efficiency and productivity across the supply chain. Register today to attend #CSCMPEDGE, the premier event in #supplychain. CSCMP’s 28th Annual “State of Logistics Report,” Presented by Penske Logistics - CSCMP and Penske Logistics invite you to join A.T. Kearney, the author of the Annual CSCMP State of Logistics Report, to hear highlights and trends emerging from this year’s report, marking the 28th anniversary of this important and updated offering. The “Uber” Model for Warehousing Goes Mainstream – What works today, what still needs tuning, and what’s likely to come. Amazon: The Future of Customer Satisfaction – A don’t miss session! Innovation and disruption occur when supply chains are designed for customer obsession, rather than optimized for service and cost. Amazon’s networks are built on the culture of working backwards from the customer. Discovering Hidden Profit-Advanced Supply Chain Decision Making - A highly interactive session will detail a thoughtful and actionable methodology to extracting hidden profit by connecting people and business processes in order to maximize customer value at the lowest possible total cost. Learn how SCM and leadership is critical to overall business success, recognizing the need to become system thinkers while collaborating to improve the business across all processes. There’s no better place to gain an understanding of these trends and build the toolkit you need to prepare for these change drivers than at EDGE, CSCMP’s 2017 Supply Chain Conference. 18 tracks and 100 sessions, totaling over 32 hours of educational content with a dedicated supply chain focus. 25+ hours of dedicated networking to meet with key customers, prospects and industry thought leaders. Education on the latest supply chain trends, research, data analytics, and economic analysis to enhance your knowledge base. Real-world strategies for process improvement, profit maximization, budget oversight, and talent development and retention. Over 600 companies in attendance. Register today and join #supplychain thought leaders from around the world at #CSCMPEDGE. With 12 tracks dedicated to the cornerstones of supply chain management, there is one track designed for you. We encourage you to browse all sessions via track, date or speaker! Complete your registration at cscmpedge.org. All-access and one-day registrations still available. Since 1963, the Council of Supply Chain Management Professionals (CSCMP) has been the leading worldwide professional association dedicated to education, research, and the advancement of the supply chain management profession. With more than 9,000 members globally, representing business, government, and academia from 62 countries, CSCMP members are the leading practitioners and authorities in the fields of logistics and supply chain management. For more information, visit https://cscmp.org.